BestWhip is a global leader in compressed gas technologies for food applications. 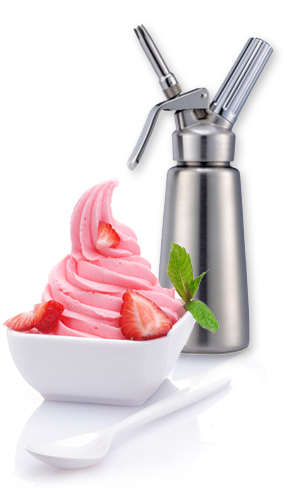 Thousands of coffee shops, ice-cream parlors, and restaurants, including leading gourmet chains on all continents around the world, use our whip cream chargers and dispensers to make fresh whipped cream. The BestWhip Experience is about passion for a quality product and excellent customer service. We are here to accommodate your product needs, and our customer service department will do whatever it takes for your full satisfaction. Feel free to contact us anytime with questions or comments you might have. It is our goal to provide you excellent customer service and a dispenser full of perfect whipped cream. Whipped cream made with a BestWhip nitrous oxide charger is by far the freshest whipped cream you will ever taste. When you use N2O to whip your cream, it only whips what you need. The rest of the cream remains in the dispenser untouched until you are ready to use it. The nitrous in the dispenser also inhibits bacteria and degradation of the cream, and allows the cream to last in your refrigerator for up to two weeks. Using nitrous oxide produces whipped cream that has four times the volume of the cream used, which makes whipped cream produced far more economical than whipping it by hand or purchasing one of the store bought varieties. What Are Whipped Cream Dispensers and Chargers? Whipped cream dispensers are devices pressurized with nitrous oxide chargers. The chargers aerate the cream as it comes out of the nozzle. This produces fresh whipped cream in a matter of seconds. These canisters can then be stored in the refrigerator for up to 10 days. There are many benefits to making your whipped cream at home. For starters, homemade whipped cream has a much better flavor and consistency than commercial whipped cream, and unlike the store bought versions, homemade whipped cream doesn't contain unhealthy preservatives and chemicals. With homemade whipped cream, you can ensure cleanliness in preparation and freshness. You also have control over the fat content of the cream you use and the amount of sugar you add. BestWhip offers a very unique rewards program designed to generate points for every purchase you make. Our reward system allows you to apply points as coupons to save on any purchase form the website. Your personal account information is location in My Account under the heading Rewards Points. The system is automatic once you register for the site. Each 20 Reward point(s) can be redeemed for $1.00 . Each $1.00 spent will earn 1 Reward point(s). Balance limitation: Balance is limited at 10000 Reward point(s). Reach 100 Reward point(s) to start spending them.